tangy jalebi: Day 65: 2048 - Overly familiar or overly grinding? Day 65: 2048 - Overly familiar or overly grinding? 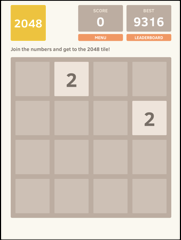 2048 (http://gabrielecirulli.github.io/2048/) is a wildly popular single-player puzzle game available on smartphones as well as the web, consisting of a 4*4 tile board, which is initially partially filled with low numbers such as 2. The objective is to slide numbered tiles on the grid to combine them and create a tile with the number 2048. The game is a variation of the sliding block puzzle where equal numbers merge to form a single tile with their sum. Figure 1: Initial setting of the tile grid, partially filled with low numbers. The filling up of blank tiles on the board reflects building time pressure eliminating the need for a separate timer. There is no alternate end state since the game is over if the board fills up without achieving 2048. Thus, as the player progresses in the game, there is an increase in the dramatic tension of the gameplay. Figure 2: As the board fills up, the player has to strategize and there is increase in dramatic tension. 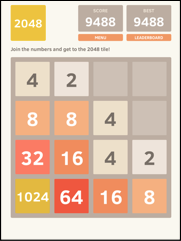 The elusive 2048 tile ensures repetitive play of the game, helping interactors gain insights about which strategies can be employed to achieve the goal. 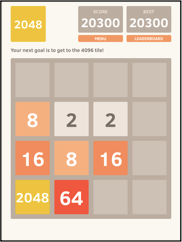 2048 includes a scoreboard and a leaderboard to ensure competition. However, the score mechanics are unclear making the score a distraction. 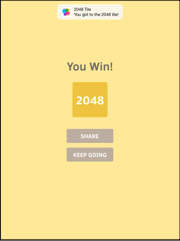 2048 tries to reach the sweet spot between being overly familiar and over grinding. Figure 3: The end state achieved when 2048 is reached. The player can ‘keep playing’ after winning.